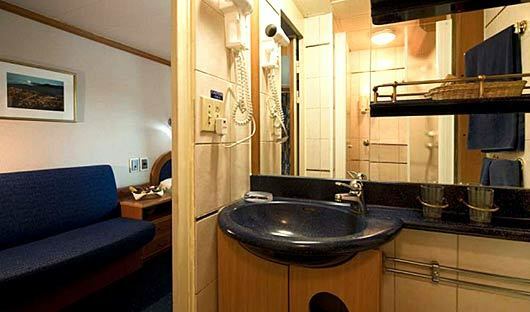 Mid-sized, first class boats offer an excellent option with many of the facilities found on larger ships on-board a small boat. 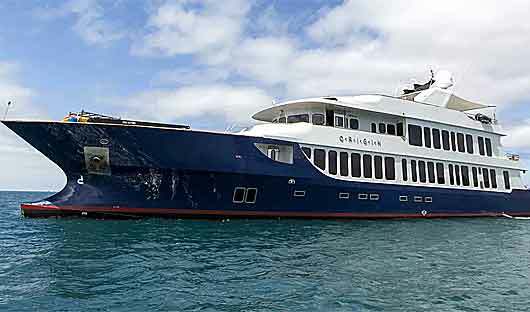 Galapagos National Park regulations mean that you’ll have one expert guide for every 16 guests when going ashore. 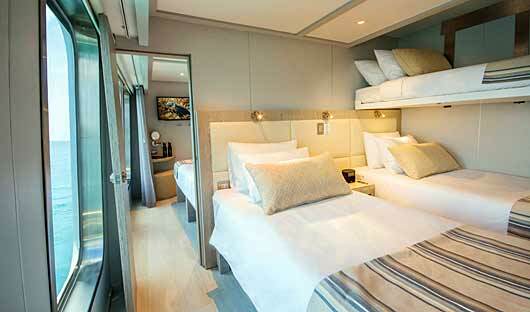 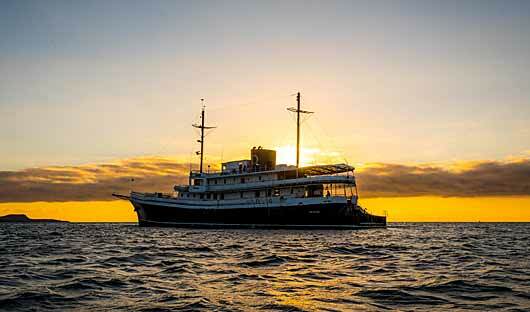 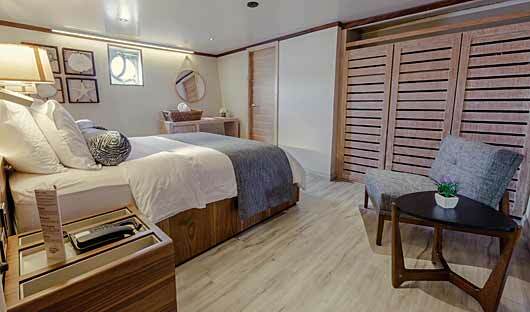 The MV Origin is a comfortable 20 guest vessel offers luxury amenities, and environmental sustainability. 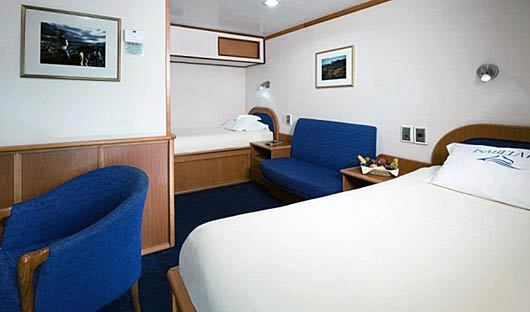 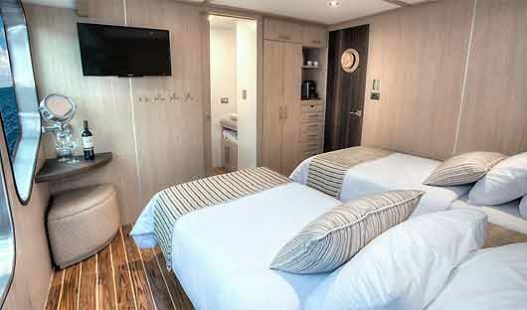 The 10 staterooms are spacious and inviting, with large windows, private bathrooms, and plenty of storage space. 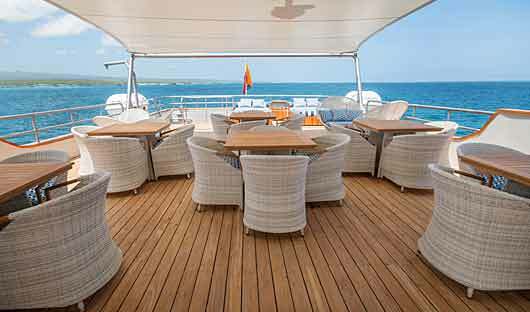 The elegant dining room features marble table tops and lunch is generally served al fresco on the sundeck, which is equipped with day beds, chaises lounges, tables, hammocks, a four-person Jacuzzi, outdoor shower and a wet bar. 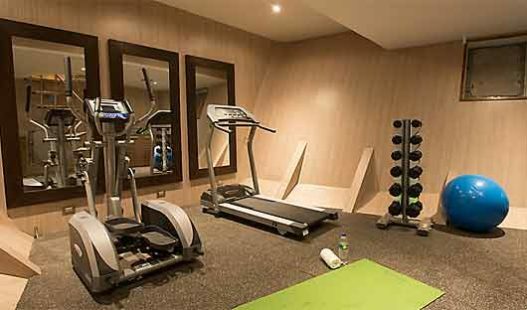 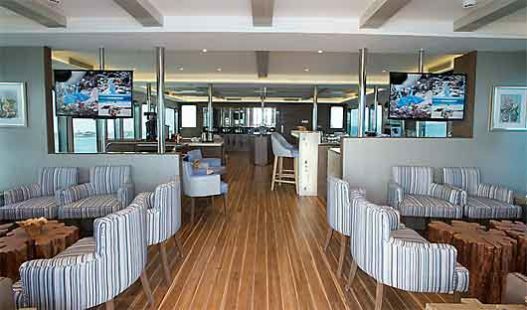 Interior social areas include a comfortable lounge for evening gatherings and general relaxation, and a cozy library stocked with books on the Galapagos and Darwin and there is a fitness centre for guests to use. 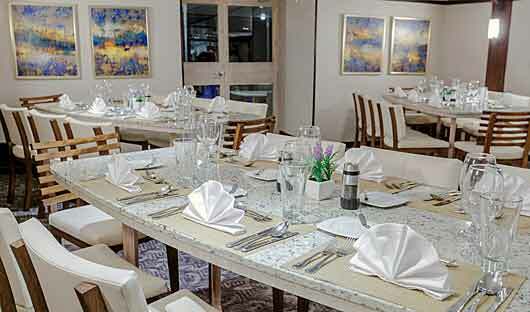 Wi-Fi is now available (additional charges apply). 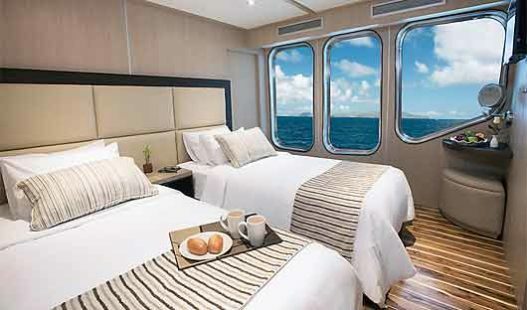 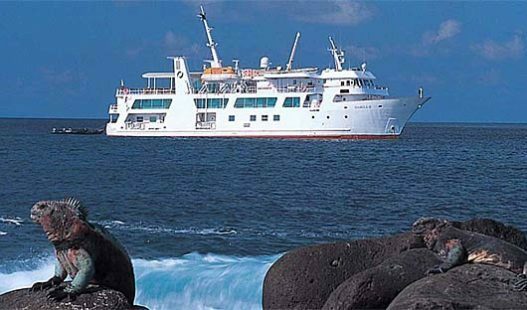 The MV Theory is a brand new, state of the art luxurious cruise vessel that will operate in Galapagos starting in 2019 as the sister yacht to the MV Origin – offering a combination of eco-friendly features, modern furnishings and high-end amenities with remarkable speed and precision. 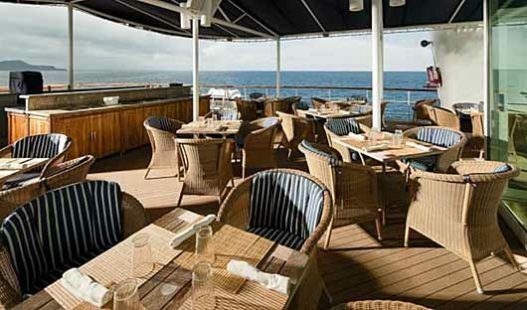 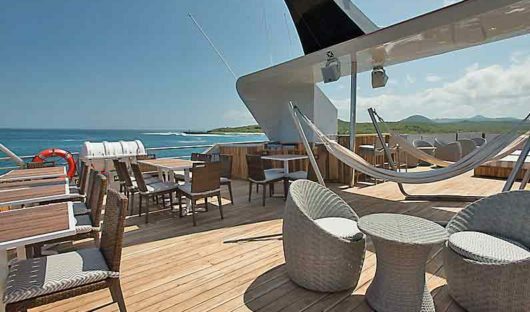 The sundeck features shaded outdoor dining, day beds and loungers, bar and outdoor shower. There is also a four person Jacuzzi and fitness center on board. 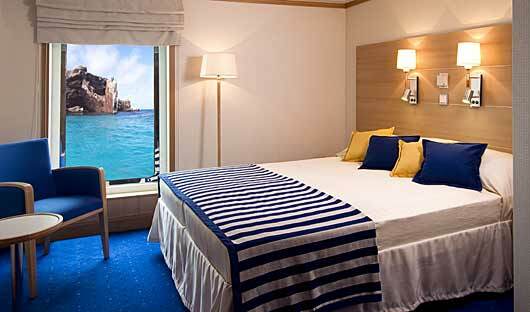 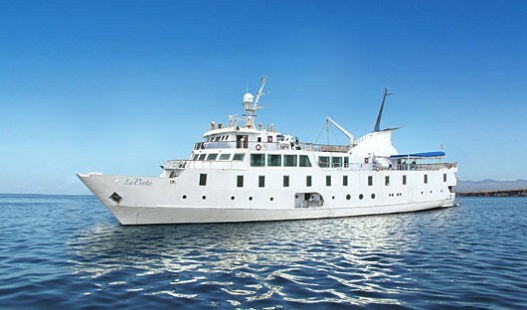 The Theory will offer 10 spacious deluxe staterooms with ocean views. 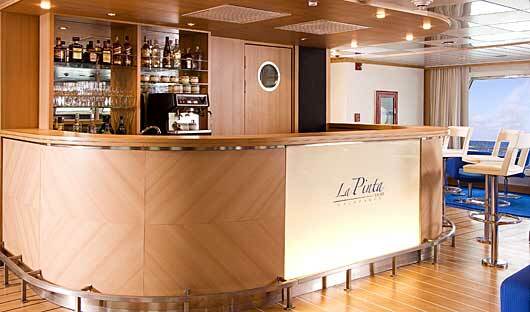 Guests enjoy an open bar and each meal is carefully prepared by culinary school trained chefs using only the finest, locally sourced ingredients. 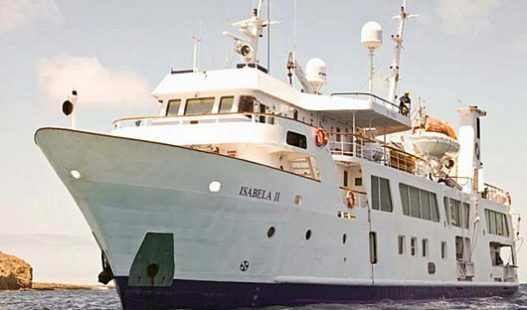 The knowledgeable naturalist guides take guests in small groups of no more than ten per guide, creating an in-depth and intimate learning environment. 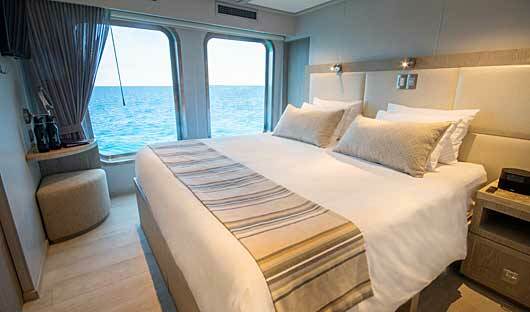 Theory will also have a clear-bottom zodiac to provide guests a view underwater while en route to excursions. 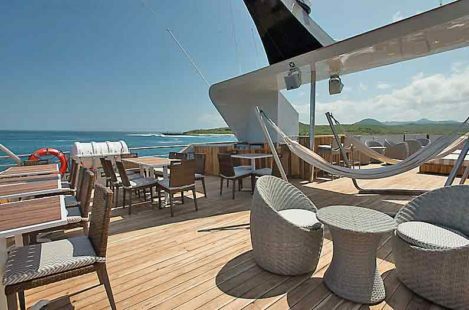 A first class vessel that maintains a stylish yet informal ambience, the 64-metre long La Pinta boasts 24 very large staterooms located on the mid-deck, all exterior with floor-to-ceiling windows. 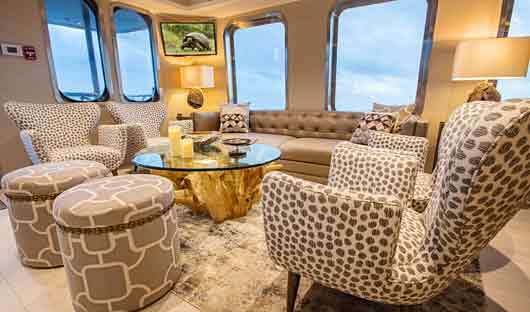 Among the spacious public areas are a comfortable lounge and conference area for nightly briefings, a reference library, separate dining areas both inside and out (for al fresco meals when weather permits), and a choice of deck bars. 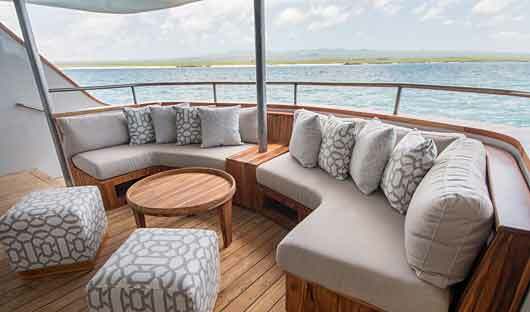 In addition its outside deck areas are wonderful havens for relaxation with a sundeck featuring a jacuzzi and sun-loungers, and an observation platform for dolphin- and whale-watching on the top deck. An exclusive motor yacht that offers a relaxed experience of the Galapagos Islands, Isabela II offers guests 20 spacious outside cabins, each air-conditioned with twin/double beds, smart décor and private facilities. 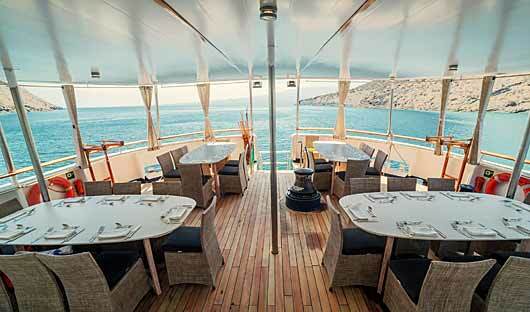 The vessel is almost 54 metres long and provides all the facilities of a much larger vessel. 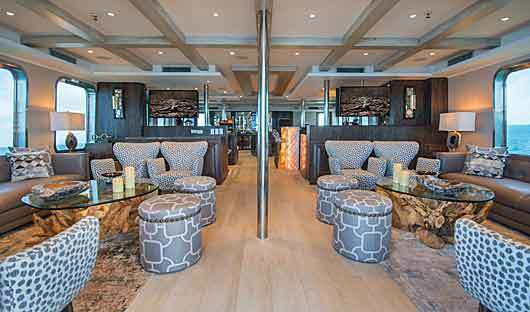 An extensive interior design refresh throughout the dining room, lounge and bar has made them even more popular as guests’ favourite social areas. 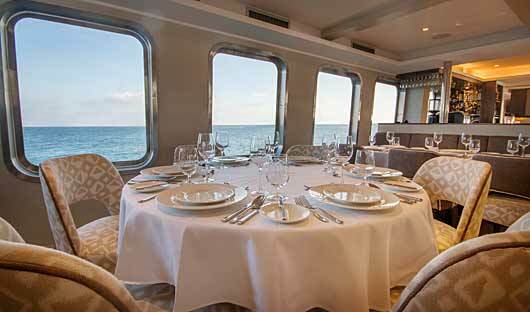 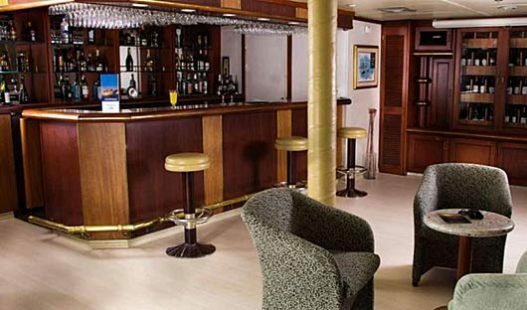 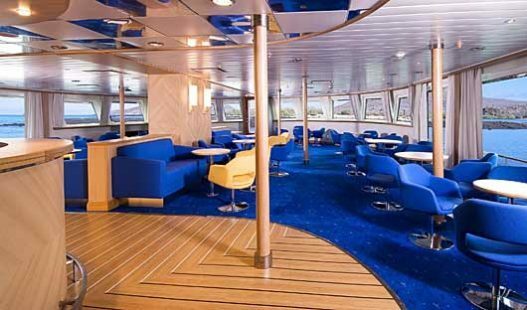 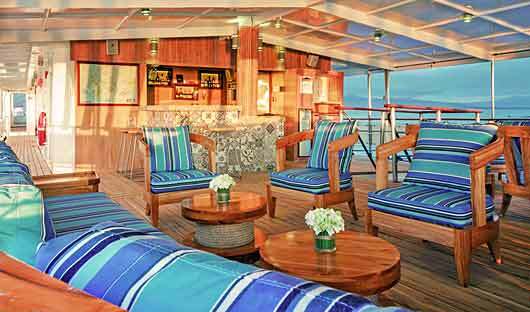 On the ample sundeck there is a jacuzzi, a small gym, a bar and an observation platform for marine wildlife spotting. 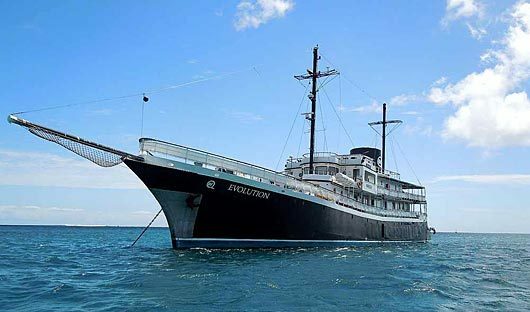 At 60 metres in length and with the appearance and ambiance of a traditional 1920s cruising yacht, Evolution successfully delivers the level of comfort and safety expected by a contemporary present. 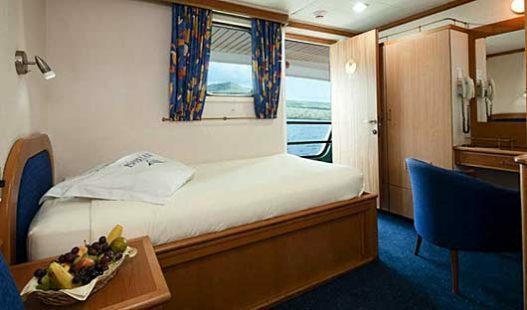 It combines spacious lounge and dining areas (inside and al fresco) and open decks with first class amenities and service and the ship underwent a refurbishment in 2017. 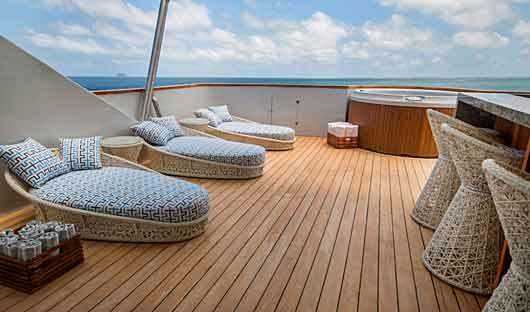 On board the Evolution features include a library/lecture room, an entertainment centre, and a canopied Sky Deck lounge with a bar and rattan furniture, and at the bow, a jacuzzi and lounge chairs for sunbathing. 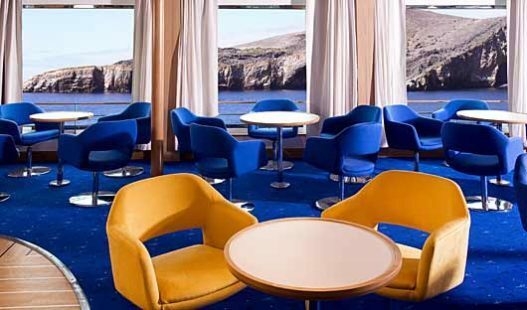 Cruise Durations: 8 and 15 day itineraries. 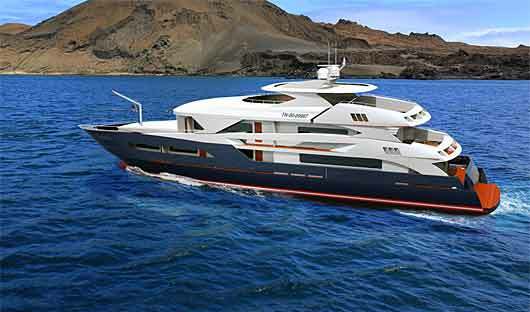 The Infinity is a newly built yacht (2018) that offers spacious and luxurious cabins and suites all with private balconies. 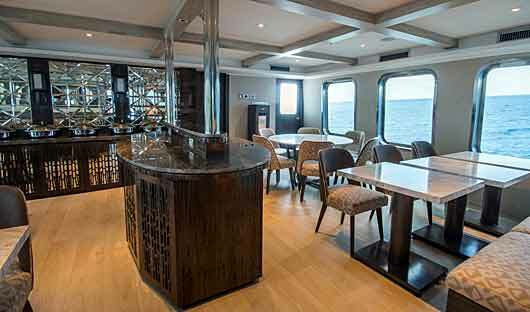 The 49m long yacht takes up to 20 guests and is equipt with beautifully decorated communal areas including a dining room, lounge, sundeck with dining areas and a jacuzzi. Cruise Durations: 8, 5 and 4 day itineraries.